Red-faced tax officials have been forced to apologise today for two embarrassing mistakes over late-filing penalties. Last weekend HM Revenue and Customs denied fining taxpayers for failing to submit their self-assessment returns online - even though the deadline is still almost two weeks away. But on Monday HMRC admitted that some people have been wrongly charged. It has promised to cancel the penalty charges and apologised for the error. Some 653 people who submitted their tax returns by the start of January were hit by the bogus late-filing penalty charges. 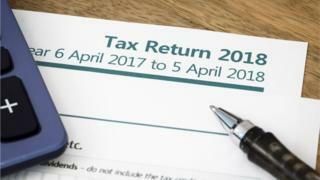 They received letters from HMRC telling them they'd missed the deadline and so had to pay a penalty of £100, even though many had submitted returns almost a month ahead of the 31 January deadline. Accountancy firm Blick Rothenberg reported that a few of its clients had received such letters. It said one received a notice they'd be fined after submitting their return electronically earlier this month. Dan Neidle submitted his information online at the beginning of January, but then was shocked to receive a letter telling him he'd been fined even though he'd submitted the return early. Ironically, he's a tax partner at the international law firm Clifford Chance. Mr Neidle said: "I thought, oh no not again, as they did it to me last year even though I filed on time. The difference this time was that they sent the fine before the 31 January deadline." He said that the fine is yet to be cancelled and that he is looking forward to receiving an apology, which "I intend to frame!" More seriously, he warned that as a tax partner, getting the wrong penalty notice was "something I can deal with." "But if it was sent to normal taxpayers, particularly vulnerable people, that would be much more serious." When approached by the BBC about the errors, HMRC went on the offensive, insisting that no penalty notices had been sent to customers doing their self-assessment online. In a strongly-worded statement HMRC said: "Any assertion we have sent early penalty notices to customers doing their returns online is false". But on Monday it was forced into an embarrassing back-track after discovering that there was a problem. Specifically, it said that hundreds of people who had made online returns for trusts that they manage, that were processed on 2 January, were wrongly sent a late-filing fine of £100. An HMRC spokesperson said: "Due to human error in processing some online trust returns a small number of trustees or agents have been inadvertently issued with late-filing penalties." It said all affected returns had been identified and the late-filing penalties cancelled. The spokesperson added: "We apologise for any issues this may have caused our customers and are writing to them directly to let them know." Robert Pullen, a partner at Blick Rothenberg, said: "I'm pleased that HMRC has finally admitted there's been a mistake. "The mistake was bad enough, affecting as it did more than 600 people, but if something went really wrong it could hit thousands or millions."